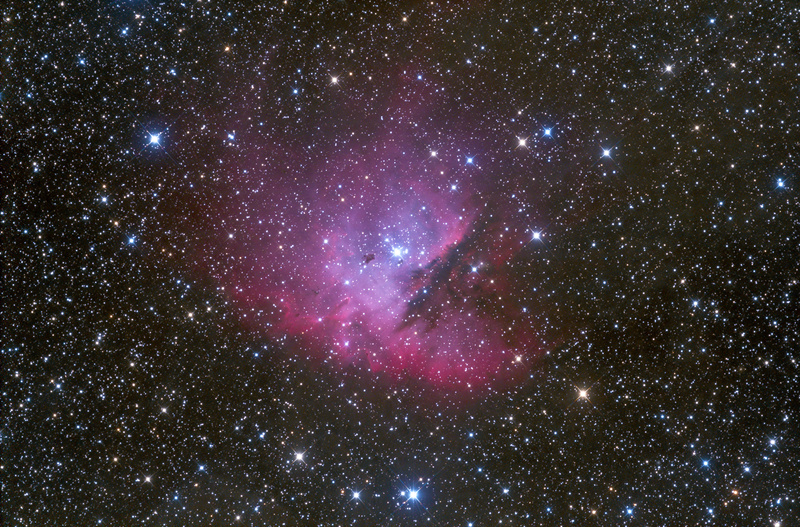 The Pacman Nebula has got its name because of its appearance that resembles the main character in the famous video game Pacman. The nebula was discovered by Edward Emerson Barnard in 1883, in the NGC catalogue it is identified as NGC 281, while in the Sharpless catalogue, its labelled as Sh2-184. The nebula is visible in the direction of Cassiopeia, about 9500 light-years from the Earth. The viewing direction and distance of the object places it in the Perseus spiral arm of The Milky Way, the galaxy in which our solar system is located. The apparent size of the nebula is about 35 arc-minutes which is slightly larger than the disc of the full Moon. At the distance of the object, this gives approximately 48 light-years in diameter. As usual in the case of active HII regions, the Pacman Nebula is remains of an interstellar cloud of gas and dust in which star formation took place recently. The newly born stars of spectral class O and B form the open cluster IC 1590 associated with the nebula. The age of the stars in the cluster is only a few million years. The stars of the cluster, especially HD 5005 the brightest member, are the source of the powerful radiation that heats and ionises the remaining gas. The aggregated stellar winds of these stars are creating a giant bubble in the gas cloud around them. Denser parts of the cloud could resist the erosion better, forming lumps called 'Bok globules'. Globules can absorb stellar winds shielding the regions back of them. The result is a dense head and a thinner tail behind, with the head pointing towards the source of the stellar wind, similar to the well known Pillars of Creation. These structures can be observed in the picture slightly left to the brightest stars those column-like shapes pointing towards the centre. Dark spots in front of the nebula are similar structures viewed from their ends. The pressure induced by the stellar winds increases the density in the globules creating optimal circumstances for star formation to begin in the future.